The overall strength of the second season of House, M.D. proves that its first-year success wasn't a fluke. This season starts with Dr. House (Golden Globe winner Hugh Laurie) pursuing his ex-wife Stacy (Sela Ward) and ending with a tragedy that could potentially be deadly for himself and two colleagues. The premise of each show follows a set routine--a patient is brought in with unusual symptoms; House challenges his trio of underlings to diagnose the problem; they treat the patient, usually incorrectly the first few tries; and then at the very last minute--through a revelation that often has little to do with the patient--House figures out what's wrong and saves the day. It would be easy for this set up to grow old fast. But because of the smart writing, nuanced acting, and believability of the characters (who're often dealing with unbelievable scenarios), the formula works on each of the 24 episodes that aired on Fox during the 2005-2006 season. Viewers have been conditioned by the Marcus Welbys of the TV world to think of doctors as saviors. Even on ER, the most narcissistic physician was selfless at heart. But House is a different breed. When he's at an off-track betting parlor and a woman collapses, he doesn't miss a beat. Still eying his race on television, he asks, "Is anybody here a doctor?" He'll mock a sick patient's complaints with a sarcastic, "Boo hoo!" And, if there happens to be a dead body around, he has no qualms about shooting it if he believes that could help diagnose another gun-shot victim. A one-of-a-kind series, House, M.D. : Season 2, brings to the screen more everyday encounters of a team of doctors of the Diagnostics department of the Princeton-Plainsboro Teaching Hospital in New Jersey under the supervision of Dr. Gregory House. Hugh Laurie, Jennifer Morrison, Jesse Spencer, Omar Epps, Lisa Edelstein, Robert Sean Leonard, and the rest of this EXTRAORDINARY cast, have truly outdone themselves with their performances, which are outstanding to say the least. All the actors, without exceptions, give it their 100% and it really shows (the chemistry is AMAZING)! Very well written and very well presented, the series is without a doubt guaranteed to provide more than just a few thrills, not to mention a few laughs and tears. House, M.D. does a great job of describing people's different personalities, fears, and the problems they face. It is all about life, death, human relations, hope, pain, and inner strength. The acting, the setting, the plot (and subplots), the dialogues, and the music, which are just wonderful! It is indeed a rarity when an amazing series such as this comes by. In short, House, M.D. is a series definitely worth watching and one to seriously consider adding to your movie collection (if you haven't done so already)! KEEP'EM COMING!!! Recently I watched the complete first season of House M.D. ; I thought it was a perfect show. House was gripping, entertaining, and a complete jerk. I loved him. Season 2 takes this show to an entirely new level though. House is established within the first few episodes for those who have not seen the initial season. After this, the series begins to build more characters that are dynamic. As if House was not enough, they now develop the personality of his team of doctors. Chase, Foreman, and Carmen all go through character cycles that build on you. House is a painkiller-addicted doctor who walks with a limp due to a muscle being removed in his leg. He is the best doctor in the hospital, but is often apathetic and hates patients. The storyline of a common episode will depict House and his team trying to find out what is wrong with an abnormal patient. They will come up with a solution and find out it is wrong. Then they continue to find solutions until they find the right one. Along the way, there is plenty of gore and snide remarks on behalf of House. Almost every episode has this underlying pattern. The episodes often break off into side plots, which actually become the main plot. This creates multiple captivating plots. Character development branches off these side plots. At the end of the Season, you feel like you know each character. You do not just know there character, but you know their ideals and personality given any situation. Foreman changes his character drastically about four times. Each time is progressive and makes perfect sense though. Not only does is dialogue change, but his appearance changes. Foreman came off as my favorite character in Season 2. I am not one for being a crybaby, but Foreman gave a heart-wrenching performance in a few episodes. work nights,but saw the show on a weekend rerun. It's fun to get the 'history' of the show since we didn't start watching til this past season. I personally like watching from the first season on, in order. I am so happy i got this DVD, the second season is awesome and i cant wait for the third one to come out. i am already biting my nail wondering whats going to happen next. i love tv shows but one thing that always bothered me was the fact that many had a terrific season one and the others were only good. I'm glad that House is not the case, i loved the first season, smart and funny at the same time and i didn't thought they could do twice, but they did! great season two! The season finale was mind-blowing, the writters are insane smart. I still haven't received it !! Mea culpa. I'll admit it. I happened upon House mid-second season. Little did I know within a year I'd be hooked, desperate for my weekly fix of the wickedly attractive yet insanely abrupt! Who needs mind-altering drugs when the creative symbiosis of David Shore/Bryan Singer/Katie Jacobs and the rest of their mojo-magic crew sets lovably perverse genius Hugh Laurie loose opposite affably earnest Robert Sean Leonard to do what only they can do? Um, taut innuendos, anyone? Unlike some TV actors who can't even eat a sandwich sans cue cards, the talented duo's bickering camaraderie scarfs up the subtext of both female and male dreams. House/Wilson is Greek theater being played out by the American Medical Association's Monty Python Repertory company atop a world stage while perched precariously upon a high wire. With no net, yet. Bravo. Even though Fox reruns their reruns and USA, too, it's looking like a long, hot, steamy summer until The Boys & Co. are back in town. Gulp. I like this man far, far too much. Flip this House? No way! I Am Really Pleased With House! The second season shows you more sides of House, especially when his previous lover, played by the lovely and talented Sela Ward, appears. He actually shows a tender and gentle side that he had been hiding for so long. This is also the season when he has to let Wilson move in with him for a time, giving more screen time to the wonderful Robert Sean Leonard. As much as I hate subtitles, I have to admit they've done a decent job. Even most of the extra stuff is subtitled well; I just wish they'd done the cast interview also. "Cheese Is The Devil's Plaything." "House" is a perfect television show, and is, in my opinion, the only dramatic show currently in production that's worth watching. The show, centered on the acerbic, thoroughly disagreeable, and utterly brilliant Dr. Gregory House, is well written, intelligently directed, and perfectly acted. Hugh Laurie as House deservedly gets the lion's share of the plaudits for the show, but the remaining cast is equally brilliant in their vital supporting roles. Omar Epps, Jennifer Morrison, and Jesse Spencer deserve special mention for playing the young and impressionable doctors putting up with House's eccentricities, but my favorite of the supporting cast is Robert Sean Leonard as oncologist Dr. James Wilson. Leonard's portrayal is both funny and poignant, as are the lines crafted for him by the excellent screenwriters. There are several plotlines in this season, most significantly the reappearance of ex-girlfriend Stacy, played by Sela Ward, in House's life. If I had only one thing to change about season two, it would be to take a bit less time for the Stacy subplot, which, for me, was stretched beyond its usefulness. There are many excellent episodes, and many interesting guest stars including LL Cool J, Ron Livingston, Cynthia Nixon, and Michelle Trachtenberg. The DVD set includes many extras including a "House" documentary, a blooper reel, and producer commentaries: I found them all enjoyable. Our whole family are fans of the infamous Dr.House!, This DVD is worth every cent spent, its entertaining, witty, and Gregory House is just a must see, one of a kind character. The series is fast paced, well researched, and the acting of an excellent quality. "Do I have to spell it out for you?" Dr. House is back for round 2 and hasn't lost any of the punch! Hugh Laurie, Robert Sean Leonard, Jesse Spencer, Omar Epps, Jennifer Morrison, and Lisa Edelstein reprise their memorable roles in Princeton Plainsboro Teaching Hospital for more medical mysteries and interhospital relational issues. A great concern for any sequel or season 2 is "Can they pull off the success of the first movie/season?" The answer for House is a big, confident "YES!" The addition of Stacy, House's ex-girlfriend, adds a unique dimension to the hospital, one that I thought wouldn't work. Through Stacy (and House's pursuance of his now-married former girlfriend), we are able to see that House truly can love, does love, wants to love, but is afraid of love. The scenes with House and Stacy are well done, vibrant, and impactful. Definitely no naptime here! Other episodes (such as Euphoria and The Mistake) give us glimpses into the lives of House's team members, Drs. Cameron, Chase, and Foreman. Through these episodes, we see their strengths, their weaknesses, their families, and why they became doctors in the first place. If you think for one moment that the writers will pull back and get lazy and let their characters slip, think twice. The characters are just as vibrant as in Season 1, the drama just as moving, the mysteries as puzzling and House's humor just as funny and piercing. Even those who hate Dr. Gregory House are forced to admit it -- the man is brilliant. Relying on his unconventional methods and the three fellows under his tutelage, House (Hugh Laurie) regularly cracks difficult cases that other doctors would have given up long ago. Ironically enough, the one patient House couldn't save is himself. Seven years ago, he suffered an infarction in his thigh, undergoing a dangerous surgery in an attempt to save his life. While House did survive, he was left with constant pain -- causing him to pop Vicodin like candy, walk with a serious limp, and become filled with even more bitterness than he began with. It was largely because of this that House broke up with his longtime, live-in girlfriend, attorney Stacy Warner (Sela Ward). Since that time, she's married someone else and moved on. House claims he has, too, although his behavior indicates otherwise. Added to that, House is antisocial and always thinks outside the box; as one of his fellows once said, "He doesn't even know where the box is." Introspective and much too frank, House is a loner, except for the friendship of Dr. James Wilson (Robert Sean Leonard), a young oncologist who also works at Princeton-Plainsboro Teaching Hospital, and their boss, dean of medicine Dr. Lisa Cuddy (Lisa Edelstein). Despite the verbal abuse and eccentricity that House brings, his three fellows -- Drs. Robert Chase (Jesse Spencer), Eric Foreman (Omar Epps) and Allison Cameron (Jennifer Morrison) all know that he's one of the best there is, and working with him for a few years will guarantee them their choice of jobs once they're ready to work unsupervised. Season 2 includes many guest appearances by Sela Ward as House's ex Stacy, who is hired as a hospital attorney -- causing much friction and longing between the two. There's more about Foreman's, Chase's and Cameron's backgrounds; as well as flashbacks of House's infarction. Foreman catches a deadly disease from a Patient of the Week, and the season's cliffhanger leaves House shot by a disgruntled patient. I know I'm swimming against the tide here given the other reviews, but I was really disappointed in this season. House's personality has always stretched believability, because no hospital could have a doctor like that on the staff, but it's a show, so we accepted it, telling ourselves that he's just blunt and doesn't suffer fools gladly. Apparently the writers decided that if we could accept that we were game to accept a good deal worse from not only House, but from his team as well, and the whole thing just seemed to devolve deep into soap opera land in the second season. - Not only is House his usual angry, rude, arrogant, mean self, but this season he throws himself at his old girlfriend (who is married) until she sleeps with him, and just as she's about to leave her husband House tells her to go back to him. As part of his attack plan House breaks into her therapist's office and reads her file so he'll know the weak points in her marriage. Gee, how much lower can you stoop? - In one episode House appears to decide that he needs the distraction offered by a prostitute. - When Dr. Wilson leaves his wife, he moves in with House, who is a total jerk to his only friend. He uses him, lies to him, sabotages his attempts to get an apartment, embarrasses him in front of others, and generally thinks its great fun to be cruel to someone who just found out his wife is having an affair. - Cameron is apparently intrigued by a gay recreational drug user who claims that drugs and having AIDS has somehow made him really happy, so she tries some of his drugs she finds in his backback. Cameron, all whacked out on drugs invites Chase over and seduces him. The next day she's clearly still under the influence of whatever she took and it hardly generates a shrug from House or anyone else. But then, why would anyone care if a doctor is hyped up on recreational drugs? - Cameron and Foreman bicker over some article he submitted and had published based on Cameron's writeup of a case. This goes on for several shows, both during consultations with House and in front of patients. Foreman was a jerk and Cameron handled it like a child. Grow up, people. - Cutty apparently decides she wants to have a baby. It's like they imported writers from General Hospital for this season. - Chase fails to properly diagnose a patient because he'd just found out his dad died, but for some incomprehensible reason decides to apologize to the patient's husband for being too hung over to treat her properly. Apparently he really wanted to get himself and the hospital sued (and it worked). - House shoots a corpse in the morgue to see if the MRI machine will pull bullet fragments out of a person. Apparently it will (at least in this fantasy show), but it puts the MRI machine out of commission for two weeks while it gets fixed. "My bad," says House. Indeed. - The final episode is a cliffhanger, and it turns out that almost the entire show is just House having an hallucination/dream. There is little I find less interesting than a story that isn't even real to a ficticious character. All of this, combined with a few other issues convinced me that they just didn't have good writers this season. The show has a great premise and an excellent cast, but the writing was weak this season in my opinion, because instead of writing solid, interesting stories, they resorted to cheap soap opera plot devices. Character development is good, but the cases need to be interesting as well, and character destruction is not the same as character development. As for the cases, well, you'd think lumbar punctures, MRIs, and biopsies are the only diagnostic tools they have, and virtually any combination of symptoms can be explained by one of about a half-dozen conditions that get mentioned in almost every show (and never turn out to be the problem). In general there's less focus on cases and more on the interpersonal turmoil than there was in season one, and I thought thought the show suffered for it. House's clinic patients offered some comic relief in season one, and we still see some in season two, but not as many, and I missed them. We also see less of House watching soap operas. I guess since the show had become one there was less reason for him to watch them. And finally, for reasons I can't explain, in a few shows this season I never quite understood what was wrong with the main patient. I never had that problem in season one, but somehow the part where we find out what the problem was seemed rushed at times in this season, to the point I missed it altogether in a few episodes. I first saw House because I've been a fan of Hugh Laurie since "Blackadder" and "A Bit of Fry and Laurie", and I wanted to see how he'd do in a role that's obviously so far from the characters that made him famous (in Britain at least). I must admit that I had not the slightest inkling of a fraction of an idea, that "House, M.D" would turn out to be this brilliant. Because that is what it is: Brilliant. Laurie plays the calculating, narcissistic, and effulgent dr. Gregory House to perfection. It is however not a one-man show and Laurie's co-stars all do a very good job playing his subordinates, friend(s), and colleagues, but especially Lisa Edelstein as House's boss Lisa Cuddy is worth of much applause. The stories are interesting and fascinating, very well written, and well played. There's just enough medical jargon to make it seem expertly confusing and realistic, yet not boring the viewer to tears. The same goes for the humour and the quick witted banter that makes out most of the dialogue. It's humorous but not comedic, it's quick but not 'this was obviously written to show how fast and witty these people are'. This is a great series with fine actors given extraordinary scripts so they can show off their talents. House is the perfect antihero. He's certainly not Doctor Kildare, but despite his handicaps, physical and emotional, he never wavers from doing right--at least in his eyes. The creators pay homage to Sir Arthur Conan Doyle (a doctor that says Holmes was based partly on Dr. Bell) by giving their characters similar names to Doyle's creation and throwing occasional hints at the audience; like the episode where House says he got another Conan Doyle book for Christmas or giving the man who shot House the name of Moriarty. 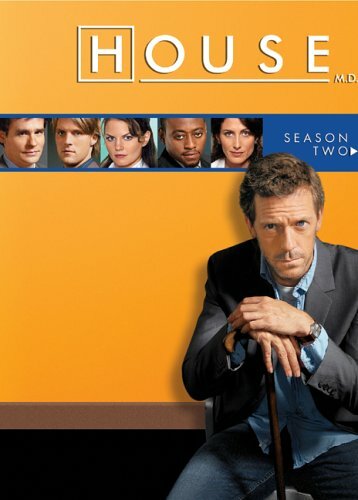 http://www.housemd-guide.com/holmesian.php, a site dedicated to the House series. Most people don't realize that Sherlock Holmes is the most depicted character in film--over 200 movies or TV shows. Perhaps they ought to add all the House episodes to this tally. Don't you guys feel sick of watching the love affairs of Dr.Grey? How can you not know Dr.House? you should check out the more exciting Season 2. Ostentatiously as a gift for my brother, I bought season 1 of House and voraciously watched. Season 2 was purchased with no such qualms, and shortly my mother and I were having almost nightly "House parties" with season 2.